Selah Finalist In Inspirational and Gift Books Are you in the midst of tough times? Perhaps you’re unemployed, underemployed, or having financial difficulties that leave you feeling hopeless and helpless. Do you question if God is aware of your circumstances? Are you wondering if there is a way out of your situation? Cynthia Howerter and La-Tan Roland Murphy have both experienced God’s provision in tough times. Along with guest writers, they candidly share their own personal stories of unemployment and financial despair. You will find encouragement and hope as you read each story. Like you, many of these writers have lost their income, savings, homes, and health insurance. Some have found themselves on public assistance while others faced homelessness. Their faith and trust was refined and strengthened as God provided a successful path through their tough times. Each writer’s personal story demonstrates the power of God who knows exactly what you are going through and who promises to care for those who put their faith and trust in Him. 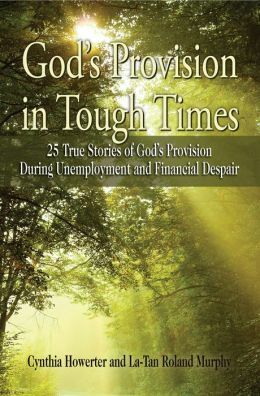 God’s Provision in Tough Times includes personal accounts by guest writers Alycia W. Morales, Beth K. Fortune, Carrie Fancett Pagels, Cecil Stokes, Dan Walsh, Deborah Raney, Dee Dee Parker, Eddie Jones, Eva Marie Everson, Felicia Bowen Bridges, James L. Rubart, Ramona Richards, Roger E. Bruner, Tamara D. Fickas, and Torry Martin.